If you go to Beech Bend Park and Splash Lagoon expecting a Disney-like experience, you are going to be disappointed. Beech Bend is not Disney. Heck, it’s not even Six Flags. But it is cheaper and closer than all those places and we always have tons of fun when we go! Located in Bowling Green, KY, Beech Bend Park and Splash Lagoon is no more than a 2 hour drive from most places in Middle Tennessee. Since they usually around 10:30 AM, this place would be a great day trip that doesn’t require loading the kids up at the crack of dawn. Remember though that you will be super tired when you have to make the trip home when the park closes in the evening. So think about staying a night or two and seeing more family friendly places in the area. 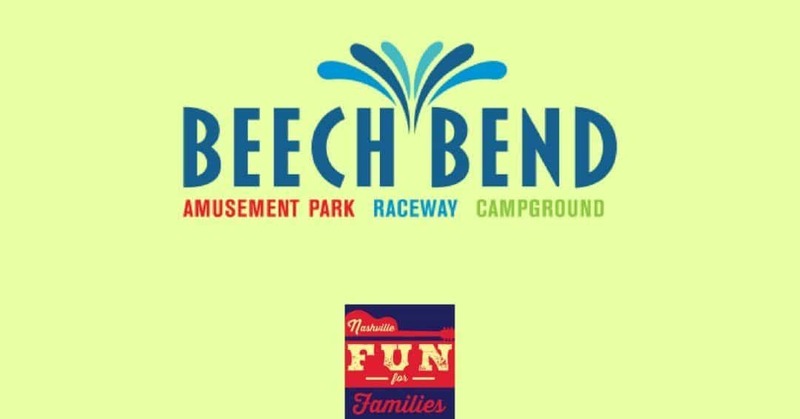 The Corvette Museum, The Lost River Cave, Dinosaur World and Kentucky Down Under are all located within 30 minutes of Beech Bend Park and Splash Lagoon. Beech Park Park is pretty easy to find. Once you get close, there are lots of signs leading the way. It is located in a very rural area and for the last few miles, you will be convinced you must be going the wrong way. Once you arrive, turn into the parking area to the right. (The area to the left is for the campground attached to the park. My family has also camped here in the past and really enjoyed the experience!) Some of the parking closest to the entrance is paved but many are not. The lot is laid out well so you shouldn’t have any trouble getting out at the end of the day. When you enter the park, you can go straight through the gate if you have pre-purchased tickets. Buying tickets online will save you around $3 per ticket. So it’s really just a matter of deciding how much it’s worth to you to skip the line by buying tickets from home. Be aware that, like most theme parks, admission is based upon size, not age. Since my kids are all fairly tall, I had to pay adult admission on everyone in my group. Despite the fact that half of this park is a water park, swimsuits are not allowed anywhere except the water area. Shirts and shoes are required in all the other areas. We handle this in a couple of ways. Either I make the kids wear their swimsuits underneath their street clothes or we go out to the car between parks and change clothes.There are no changing rooms at Beech Bend. Once you have made it inside the park, a left will take you to the rides and a right will take you to Splash Lagoon Water Park. The entire park is basically a big circle. We always start with the dry stuff and end the day in the pools. The rides at Beech Bend are the kind of rides you would expect to find at a carnival or county fair. All our visits have been on weekdays during the summer and we have never experienced long wait times for rides. This is one of the best things about this park. As you walk through the park, you will find rides for adults and children.There are a few areas specifically for small children’s rides but, for the most part, they are all mixed together. There are lots of benches and tables throughout the park. Also be aware that there are several gazebos in the park that are designated as smoking areas. Try to steer clear of these if you have young kids. Beech Bend has one large roller coaster. The Kentucky Rumbler is a favorite of my adventurous kids. There is a concession area and gift shop right in front of the coaster. In this area, you will also find a log ride. You will get wet on this ride and there is also a ‘Splash Zone’ in front in case you aren’t quite wet enough. Past this area is the petting farm. This is a large barn with an enclosed yard.When we visited, there were mainly goats in the barn. Food is available for purchase if you want to feed them. On the other side of the Petting Farm, you will find more rides including bumper cars, flying swings and a haunted house. The theater is on this side also. Different entertainment is provided here several times per day. A large carousel, carnival type games and a miniature golf course run through the middle of the park. The golf and games have an additional fee to play. As you make your way around to the end of the rides, there is a large air-conditioned building with restrooms, concessions and games. This is where we usually eat lunch. Meals are around 6-8 dollars. Beech Bend also offers a large souvenir cup for soft drinks. It has a one-time fee of 7 dollars to buy and then 99 cent refills for the rest of your trip. Between 5 kids, we refilled that cup about 6 times in one day so it ended up being a reasonable expense for us. Outside food and drink is not allowed in the park but they will stamp your hand if you want to leave the park to have lunch. One of the entrances to Splash Lagoon is right outside the concession building. Splash Lagoon features lots of great water park fun. Even on the busiest days, you should not have trouble claiming a seat at Splash Lagoon. There are chaise lounges, deck chairs, and picnic tables in abundance. Splash Lagoon does offer free sunscreen. It is a lotion you can dispense at several different kiosks located throughout the water park. There are two huge water slides. Facing them is the old pool from the original park. This pool is mainly for swimming but it does have a rope course down the center that my kids absolutely loved. There is a large lazy river at Splash Lagoon. This is my favorite part of any water park. Don’t worry about finding a float. Splash Lagoon has plenty to go around. My only complaint about the lazy river is that it goes through the wave pool. So if you come out when there are no waves, you have to get out of your float to make it across and back into the river. And if you come out when the waves are on…look out! Those waves are big and it’s a lot more like white water rafting than lazy floating. The wave pool is one of the most popular parts of Splash Lagoon. There are lots of chairs set up right on the ‘shore’ so you can watch and get wet if you don’t feel brave enough to fight the waves. The last section of Splash Lagoon is a gigantic kids area. This spot is full of small slides, water sprayers and one of those massive buckets that dumps water out periodically.